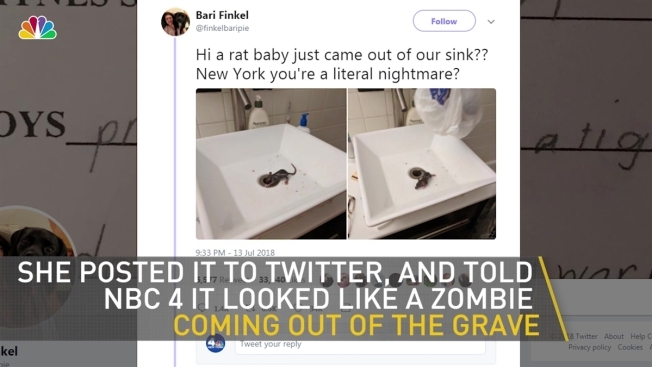 A Brooklyn couple experienced firsthand one of New York City’s most disgusting urban legends: a rat came wiggling its way out of their plumbing. Bari Finkel said a rat crawled out of the sink drain in their Bedford-Stuyvesant brownstone Friday night. “It looked like a zombie coming out of the grave,” she recalled. Finkel said it was actually her boyfriend who discovered something amiss with the sink -- which had no stopper because of a slow drain -- while using the restroom. When he looked over at let out a yelp, Finkel went over to the bathroom thinking that he had somehow hurt himself. She said she let out her own horrified scream when she saw the critter for herself. “I looked over and saw this small creature just emerging from the drain,” she said. Finkel said she went back to the living room to keep her dogs out of the bathroom while her boyfriend tried to handle the situation with a grocery bag. But she said she went back into the bathroom to document what had happened. She said that when she lifted the bag to get pictures, the rat escaped the only way it could: it climbed back down the drain. “I’m glad we didn’t have to figure out what to do with it, but I did not love the idea of it being in the pipes,” she said. Finkel said she’d never seen rodents in her apartment building before, and even members of her block association had never heard of anything like that happening. They were a little wary of using the bathroom for a few hours after the critter’s visit, Finkel said, but they don’t have any plans to change their routine -- other than replacing their sink stopper.